Sandmeyer Steel Company stocks a full line of Alloy 2304 stainless steel plate in thicknesses from 3/16" (4.8 mm) through 1-1/2" (38.1mm) and is a cost-effective solution for 316L stainless steel plate applications. Alloy 2304 (UNS S32304) is a 23% chromium, 4% nickel, molybdenum-free duplex stainless steel. The Alloy 2304 has corrosion resistance properties similar to 316L. Furthermore, its mechanical properties, i.e., yield strength, are twice those of 304L/316L austenitic grades. This allows the designer to save weight, particularly for properly designed pressure vessel applications. The alloy is particularly suitable for applications covering the -50°C/+300°C (-58°F/572°F) temperature range. Lower temperatures may also be considered but need some restrictions, particularly for welded structures. Because of its high chromium content (23%) the corrosion resistance properties of 2304 are almost equivalent to those of 316L. 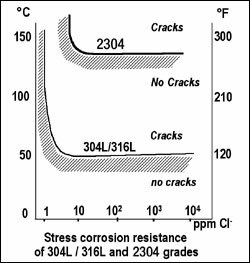 The 23% chromium and 0.1% nitrogen additions explain why 2304 duplex stainless steel behaves much better than Alloy 316L when considering pitting and crevice corrosion resistance. Stress corrosion resistance test results in chloride containing aqueous solutions ((8ppm 02) PH =7, >1000 h, applied stresses higher than the yield strength) show that Alloy 2304 outperforms Alloys 304L and 316L, due to its high chromium additions and low nickel contents. This is a typical feature of duplex stainless steels. Alloy 2205 performs still better than 2304 in similar conditions. Alloy 2304 duplex stainless steel successfully passes most of the standard IC test procedures such as ASTM, A262E, and C tests. 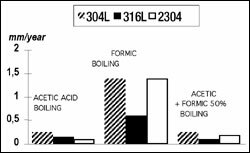 Its corrosion rate in boiling nitric acid (65%) is higher than that of Alloy 316L. Due to its high yield strength, the alloy performs well in abrasion/corrosion applications. 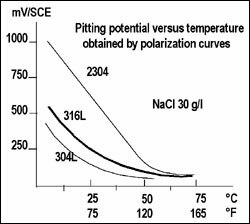 The chemical analysis of 2304 is optimized to obtain a typical 50 a / 50 g microstructure after solution annealing treatment at 950°/1050°C (1742°/1922°F). The microstructure of 2304 duplex is very stable compared to molybdenum-containing duplex stainless steels. Intermetallic phases are present only after 10 hours holding time in the 750°/850°C (1382°/1562°F) temperature range. Copper additions to 2304 grade, when specified, increase the hardness of the steel after heat treatment in the 350°/500°C (662°/932°F) temperature range. 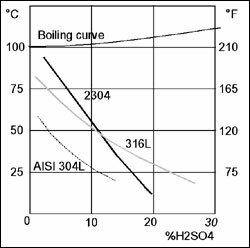 Hot forming must be performed in the 1150/900°C (2100/1650°F) temperature range. 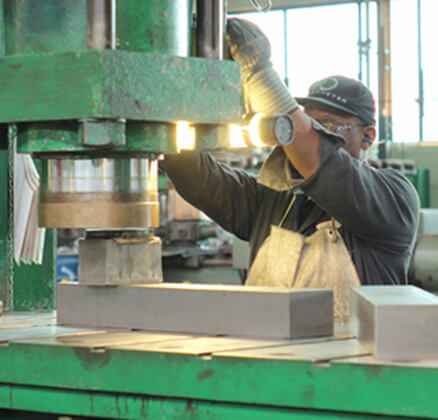 After forming, a new solution annealing treatment is recommended in the 950°/1050°C (2100°/1650°F) temperature range to fully restore corrosion resistance properties and mechanical properties. Parts formed with 2304 must be supported carefully during heating to avoid creep deformation. Use the same solutions and pastes as for Alloys 304L/316L. The pickling time will be higher than for austenitic grades due to the corrosion resistance properties of the alloy. 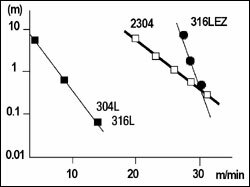 Alloy 2304 duplex exhibits improved machinability properties particularly when considering drilling. Its behavior is equivalent to that of 316LEZ*. Furthermore, 2304 has better corrosion resistance and cleanliness properties as no sulphur additions are necessary. Localized corrosion resistance behavior is improved. *316LEZ is a 316L type grade with improved machinability properties. The duplex microstructure renders the alloy less sensitive to hot cracking. The welding parameters must be optimized to obtain a controlled ferrite level (20-70%). Typical recommended heat inputs are 10-25 KJ/cm with a 150°C (302°F) max interpass temperature. These conditions must be optimized taking into account the thickness of the products and welding equipment (consult if necessary). We do not recommend pre- or post-welding heat treatments. 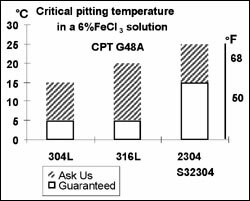 Only complete solution annealing heat treatment may be considered.